Unless you're a mechanic by trade, you've probably improvised a tool or two. Sometimes pliers are wrenches, zip ties are clamps, and you guess at the torque you're putting on that wrench. All of these things are bad for you bike and bad for your hardware, but buying all the right tools to fix an old machine would cost more than buying a new bike. Adaptors are a way to cut corners financially without cutting corners mechanically. The adjustable torque wrench adaptor by Motion Pro opens up a whole new world for your combination wrenches and Allen wrenches. This adaptor will work with any 6 mm to 19 mm (or 1/4-inch to 3/4-inch) combination wrench as well as any 6 mm to 8 mm Allen wrench. 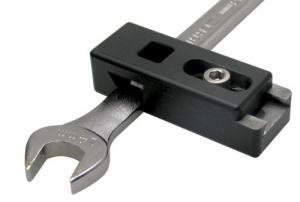 Torque any of your fasteners up to 90 ft-lbs with a 3/8-inch square drive torque wrench. It's amazing that such a tiny device can give you so many more options. Constructed of heat-treated steel and boasting a black oxide finish, this adaptor is small enough to fit in your ride kit -- although your torque wrench might not be. Either way, keep it handy and you won't put undue stress on your nuts and bolts.